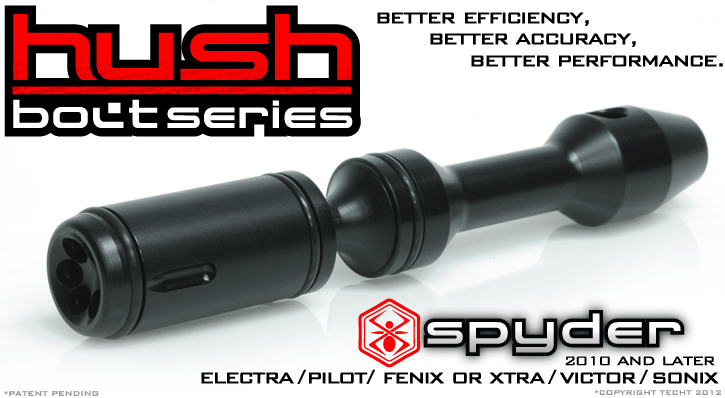 TechT's Hush Bolt for Spyder markers utilizes our new "Even-Flow" venturi face technology. This new "Even-Flow" face allows the Hush Bolt to obtain optimal efficiency, while also quieting the sound signature. The Spyder hush bolt is also much lighter which aids in reducing kick when firing the marker. Other bolt features include our ramping detents grooves which make for a much easier transition for the ball detents during each shot. The detents no longer get hung up on the face orings on the bolt return. We also added the perfect angled ramp to the face of the bolt that prevents ball clipping (chopping) and also gently pushes the ball detents down on the forward bolt stroke. All in all, we designed this bolt to perfection. The result is a bolt that is the quietest, most air efficient, most durable, and softest on the detents and balls. Quiet Operation- the Hush Bolt was designed to have a less abrupt "pop" or "crack" that has traditionally been associated with Spyder Markers. The TechT Hush Bolt has a quieter, more muffled sound signature. This means your field position is given away less, and communication on the field becomes easier than ever before. Increased Efficiency- the combination of the Even-Flow face and our unique o-ring configuration allows the Hush Bolt to seal the routing of air directly through the face. This results in less air being leaked around the bolt itself- which means far less wasted air. The Even-Flo Face also allows for extremly unform airflow- this means tighter groupings and better accuracy. 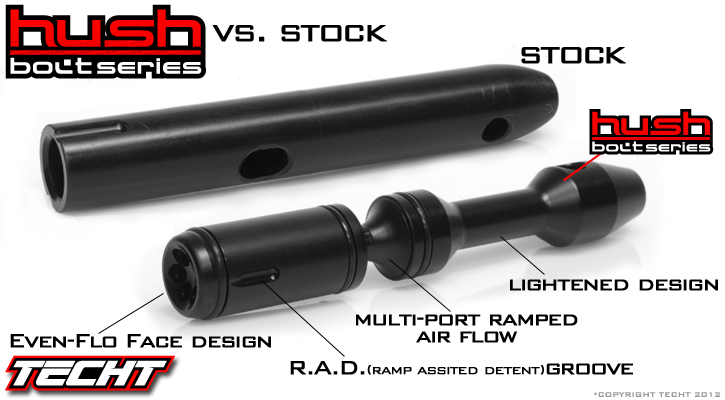 Super Light Design- the Hush Bolt weighs about 15% lighter than the stock bolt. All TechT Upgrades Carry a Full Lifetime Warranty! Check out our Spyder Hush Bolt in action! Spyder Hush Bolt works with 2010 Electra and Pilot Models Only. 2010 Models have Stock Black Bolts. If your stock bolt is white, this bolt will not work. This bolt will also work with any Fenix with the S/N 40003223 and Up. Spyder Hush Bolt works with 2010 and newer Spyder Victor, Xtra, Sonix, MR100 only. 2010 (and newer) Models have Stock Black Bolts. If your stock bolt is white, this bolt will not work. This video is what you need if your Kingman Spyder, Icon, Piranha or similar marker needs to be repair or serviced. These guns are all very similar and this video will help no matter which of these guns you have. Three times rebuild for the TechT Hush Bolt for the Spyder.